Adam Equipment, worldwide manufacturer of scales and balances for professionals, offers a range of scales for bakeries, including: WBZ retail washdown scales; AZextra retail scales; WBW-M washdown scales; GBK-M bench checkweighing scales; and GFK-M floor scales. Bakeries use scales for two crucial tasks: weighing ingredients and weighing baked goods for sale. Measuring ingredients in recipes ensures consistent formulation and controls costs. When selling bakery products by weight, using a scale to determine the cost of sale guarantees customers are getting their money's worth. Retailers must follow stringent guidelines and adhere to strict budgets. Weighing all ingredients for recipes means that bakeries are able to accurately calculate the cost of ingredients. It also means bakery patrons know that each time they buy their favorite cake at the same bakery, it will have the same consistent taste and texture. That boosts consumer confidence in product quality. 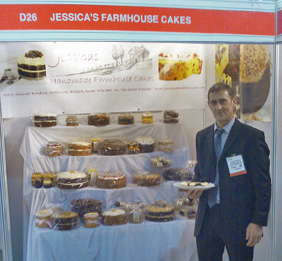 Bakers at Jessica's Farmhouse Cakes, a UK-based commercial bakery, have used an Adam Equipment scale for five years. Bakers at Jessica's Farmhouse Cakes, a UK-based commercial bakery, have used an Adam Equipment scale for five years. The scale has helped the company maintain its reputation for exceptional quality, according to Richard Bowditch, part-owner of the business. "We rely on our Adam Equipment scale to provide an accurate reading of ingredients, so that we can continue to deliver the exceptional quality cakes that our customers have come to expect" Mr. Bowditch said. "When a customer orders our baked goods, we want to be sure they enjoy the same flavour and consistency every time." Savvy consumers want high-quality baked goods, but just as importantly, they seek accuracy in quantities and amounts in their purchases. In many parts of the world, bake shops that sell products by weight are required to use approved scales. When a bakery uses approved scales, it receives the reassurance that its scales are providing accurate measurements of quantity. The approval process exists to protect both consumers and retailers. If it's discovered that a bakery is using non-approved scales to weigh its products, the business could face substantial fines and even closure. If scales aren't properly tested and approved, a retailer could risk losing a hard-earned reputation, loyal customers and ultimately sacrifice profits, according to Tom Storey, director of global marketing for Adam Equipment. "The approval process for scales helps protect consumers and retailers against fraud and costly errors" Mr. Storey said. "It's only logical that customers are more likely to trust retailers who follow the law and use approved scales." Depending on the location, different organizations approve retail scales used in the production and packaging of bakery items. In the United Kingdom and Europe, retail scale approval relies on standards set by the International Organization of Legal Metrology (OIML) or the European Community (EC). Retail scales must be certified by the National Type Evaluation Program (NTEP) in the United States. Scales and balances used for trade in Canada are approved by Measurement Canada, while devices in Australia are inspected by the National Measurement Institute of Australia (NMI). In South Africa, scales for trade use receive approval from the National Regulator for Compulsory Specifications (NRCS). In each of these regions, Adam Equipment offers a variety of approved scales. Approval ensures that all weighing equipment used for trade is suitable for its intended purpose and is sufficiently accurate. Approved scales undergo regular inspections tests and compliance checks performed by certified laboratories. Once a scale is approved, consumers can verify the approval and other information, such as the name of the accredited facility performing the tests or the date they were completed. For more than 40 years, Adam Equipment has designed and manufactured precision balances and scales for professionals worldwide in the laboratory, medical, education, industrial, food, animal and jewellery markets. Adam is committed to offering an extensive selection of weighing equipment with best-in-class value. Headquartered in the United Kingdom, the company has strategically established offices in the United States, South Africa, Australia and China to provide product support and speedy delivery to distributors. Jessica's Farmhouse Cakes is a family run business which started life in a traditional farmhouse kitchen back in 1998. It originally began as a separate enterprise to the farming business, but quickly expanded, moving into its own premises in 2002. The premises were situated in a rural area along the Dorset Heritage Coastline within the village of Burton Bradstock. Since then it has grown each year, resulting in a change to our present premises on the outskirts of the market town of Bridgeport. The recipes and baking methods originally created and developed by Jessica in the farm kitchen are still being used today, helping to create that unique 'home-made' taste. Our philosophy has always been to provide our customers with the highest quality freshly baked cakes made from the best ingredients together with a personal and efficient standard of service. The cakes are all baked and delivered fresh to order but will all freeze if required.